Philosophers, anthropologists and biologists have long puzzled over the question of human nature. It is also a question that Kant thought about deeply and returned to in many of his writings. 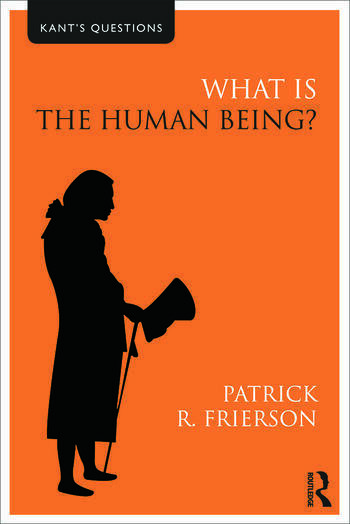 In this lucid and wide-ranging introduction to Kant’s philosophy of human nature - which is essential for understanding his thought as a whole - Patrick R. Frierson assesses Kant’s theories and examines his critics. He begins by explaining how Kant articulates three ways of addressing the question ‘what is the human being?’: the transcendental, the empirical, and the pragmatic. He then considers some of the great theorists of human nature who wrestle with Kant’s views, such as Hegel, Marx, Darwin, Nietzsche, and Freud; contemporary thinkers such as E.O.Wilson and Daniel Dennett, who have sought biological explanations of human nature; Thomas Kuhn, Michel Foucault, and Clifford Geertz, who emphasize the diversity of human beings in different times and places; and existentialist philosophers such as Sartre and Heidegger. He argues that whilst these approaches challenge and enrich Kant’s views in significant ways, all suffer from serious weaknesses that Kant’s anthropology can address. Taking a core insight of Kant’s - that human beings are fundamentally free but finite - he argues that it is the existentialists, particularly Sartre, who are the most direct heirs of his transcendental anthropology. The final part of the book is an extremely helpful overview of the work of contemporary philosophers, particularly Christine Korsgaard and Jürgen Habermas. Patrick R. Frierson explains how these philosophers engage with questions of naturalism, historicism, and existentialism while developing Kantian conceptions of the human being. Including chapter summaries and annotated further reading, What is the Human Being? is an outstanding introduction to some fundamental aspects of Kant’s thought and a judicious assessment of leading theories of human nature. It is essential reading for all students of Kant and the philosophy of human nature, as well as those in related disciplines such as anthropology, politics and sociology. Patrick R. Frierson is Associate Professor of Philosophy at Whitman College, Washington USA.